Plot: An unremarkable ghost-writer has landed a lucrative contract to redact the memoirs of Adam Lang, the former UK Prime Minister. After dominating British politics for years, Lang has retired with his wife to the USA. He lives on an island, in luxurious, isolated premises complete with a security detail and a secretarial staff. Soon, Adam Lang gets embroiled in a major scandal with international ramifications that reveals how far he was ready to go in order to nurture UK’s “special relationship” with the USA. 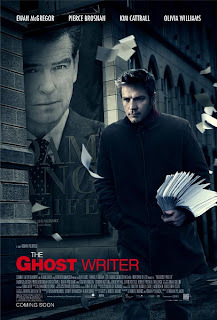 But before this controversy has started, before even he has closed the deal with the publisher, the ghost-writer gets unmistakable signs that the turgid draft he is tasked to put into shape inexplicably constitutes highly sensitive material.